What Causes Eating Disorders & How do they Affect Health? Abnormal, or disturbed, eating patterns are often accepted as standard behaviour by some adults and, indeed, children. However, they can be the sign of an eating disorder; a psychological condition that affects eating habits and, in time, will negatively impact overall health. This presentation will explore some of the fundamental causes of eating disorders and, more importantly, the negative health conditions they cause, focusing specifically on the deficiencies in micro nutrients that sufferers of disordered eating experience and how these alter health. It will explore the prevalence of eating disorders within athletes in more detail and the way in which macro and micro nutrients impact health and performance, drawing evidence from research and case studies. Although most athletes and, indeed, non-athletes who currently suffer from disorder eating tend to be female, males are at a growing risk. Especially those who compete in sports that place a strong emphasis on diet, appearance, size and weight requirements such as bodybuilding, boxing, rowing, running and horse racing. Given athletes prime condition, abnormal eating habits and periods of rapid weight loss are often ignored, being attributed to increased training loads. So much so that one expert has been quoted as saying “It doesn’t get recognised, it doesn’t get picked up, and there isn’t a coordinated response to get people well again”. Why place a large emphasis on disorders in athletes? Studies undertaken in Norway concluded that 3300 young adults were all placed at risk of developing an eating disorder, however 13.5% of athletes and only 4.6% of non-athletes possessed clinical or subclinical eating disorders. Showing that it is a present but, perhaps, overlooked problem, in many areas. Eating disorders take many different forms, typically beginning with an altered approach to eating or view of the body. The most common disorders are Anorexia Nervosa, Bulimia Nervosa and “eating disorders not otherwise specified”. Patients who experience Anorexia lose weight rapidly through mechanisms of restricting food intake and exercising to excess. This type of eating disorder will affect the heart, bone density, reproductive systems, brain matter and the endocrine system. Anorexia is often quite obvious and diagnosis is a fairly quick process. This is in stark contrast to Bulimia. Bulimia is much harder to detect with patients appearing to follow a normal eating pattern. However, a large amount of purging and overeating takes place in private. Side effects included electrolyte imbalances, hernias, dental problems, infertility and, most importantly, heart issues. The third type of eating disorder, “eating disorders not otherwise specified”, covers a wide range of topics. However, the common theme is that sufferers will have an extensive knowledge about food and its energy content; they may also weigh themselves frequently, eat secretly, over exercise to compensate for eating or have a preoccupation with weight, body image or other food issues. This is the type of disorder that most often affects athletes. Why are athletes at risk of developing eating disorders? Athletes at any level are under constant pressure to improve and perform by coaches and parents; this often involves losing weight, training when sick or injured and, in some cases, taking part in extra training sessions. Athletes already under pressure, who become injured or fail to perform, place themselves under further risk of developing disordered eating due to psychological reasons. The type of sport the athlete also partakes in has a huge bearing on their attitude toward both body image and food. A paper published by the American Dietetic Association showed that over 20% of cyclists showed signs of abnormal eating behaviour but fewer than half of those understood or accepted that what they ate, or the way they thought about food, could be classed as a disorder. In a male dominated sport, where riders in multi stage events like the Tour De France put their bodies through huge amounts of stress, this increasing trend is a concern. The heart is a muscle which, like those in your arms or legs, over time erode and weaken if not supplied with the correct vitamins and minerals required to optimally function. Disordered eating decreases pulse and blood pressure rapidly and, in serious cases, arrhythmia. The under-eating associated with anorexia has disastrous implications upon an individual’s levels of fertility. During extended periods of under-eating patients enter a form of starvation in which the body switches to consume energy purely for survival reasons; not reproduction or giving birth to offspring in unfavourable conditions. Vast changes in diet and nutritional intake cause a huge loss of bone density. In teenagers, this is particularly worrying as low density during puberty is irreversible and greatly increases the risk of osteoporosis in later life. The digestive tract of restrictive eaters is slow and under-active. The transit time of food decreases, leading to discomfort and an increased sensitivity to fullness. This is misleading and, in some cases, will lead to a further reduction and restriction of food. Below are two studies, one conducted by a scientific research team based in Norway and one an example of independent research. The first study focuses on the prevalence of eating disorders between both men and women and athletes and non-athletes (control). 1100 patients were handed a self-report questionnaire, asking various questions that would ascertain their risk of developing an eating disorder. The results concluded a higher number of non-athletes were at risk of developing ED than the athletes themselves (50.7%-25%). However, the second part of the investigation delivered differing results. 50% of those who undertook section 1 of the investigation were invited to attend clinical interviews for section 2. The results of these interviews displayed that 7% of the athlete’s questioned already showed signs or were experiencing clinical or sub clinical eating disorders. This is in contrast to 2.3% of the control group. Furthermore 14% of these patients were female and 3.2% male. The study concluded the prevalence of ED is higher in adolescent elite athletes than controls and higher in females than males. The second study compares the diet of an individual Anorexia Nervosa patient to that of the recommended diet of a man. The nutritional and caloric values of each diet are compared along with the analysis of deficient micronutrients, macronutrients and trace elements. Breakfast- 500 ml water, large black coffee. Lunch- 1 carrot, 2 apples. Dinner- vegetable lasagna, with a small serving of boiled vegetables. Drinks- 2 litres (total) water. 3 large black coffee. Breakfast- 3 pancakes, 2 slices of bacon, 1 tsp butter, coffee. Snack- 1 oz cheese, 5 crackers, ½ cup of mixed berries. Below is a graph comparing the main nutrients needed for growth in the human diet and their present levels in the two daily diets detailed above. Neither diet is perfect but it is obvious that the diet of the individual experiencing an eating disorder lacks important nutrients. Most worryingly carbohydrate, protein and calcium; all needed for the growth and repair of the body. The diet of a standard European man would look like that of the example above. It consists of 2500 calories and a range of vitamins, nutrients and minerals. With a central theme of carbohydrates and protein with added good fats, the diet provides everything that is needed for the body to function in its optimum state whilst undertaking daily activities. On the other hand, the diet displayed of an ED patient is in stark contrast. A restricted diet, lacking nutrients and variation, is consumed with large amounts of black coffee in an attempt to speed up a ‘sluggish’ metabolism along with 1 full meal in the day. This diet lacks the nutritional elements needed for the body to function at its prime. This would see extreme weight loss and a large number of the drastic negative health implications detailed above. But why do these occur? 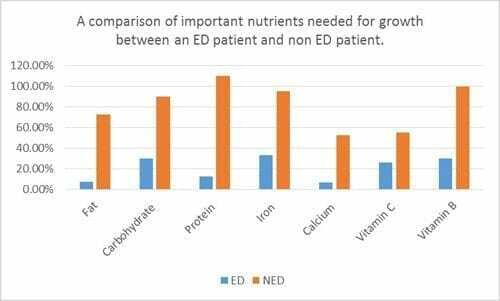 Below, the implications of a deficiency in each nutrient group caused by an ED will be discussed. Carbohydrates are the body’s main source of fuel with the brain preferring to use glucose over other fuel sources in order to function. Along with the brain, all of the tissues and cells in our body can easily use glucose as an energy source, with carbohydrates being used within the central nervous system, kidneys, brain and the muscles. A diet deficient in carbohydrates will leave an individual feeling tired, lacking energy and struggling to concentrate. Protein is the body´s primary tool in growth and tissue repair. Secondary functions include immune response and the synthesis of essential hormones and enzymes. A less than adequate intake of protein would slow down a number of these processes leading to reduced rates of growth, possible infertility and slow wound healing. Protein is found in meats, poultry, fish, meat substitutes, cheese, milk, nuts, legumes and in smaller quantities, in starchy foods and vegetables. Fat is often avoided for the fear of raising cholesterol levels and playing its role in the development of CHD. However, fats promote normal growth and development along with assisting the absorption of certain vitamins including A, D, E and K. Furthermore, fat maintains the cell membranes whilst providing taste, consistency and stability to foods. Also known as pyridoxine, vitamin B6 has several important functions throughout the body. It is one of the most important vitamins in terms of energy production and incredibly damaging if a deficiency does arise leading to lethargy, poor growth and inadequate bone density. Tasked with the synthesis of carbohydrates and protein, vitamin B6 can be found in milk, potatoes, fish and bread. Protecting cells, assisting with wound healing and maintaining connective tissue are all functions of Vitamin C. Otherwise known as ascorbic acid, the vitamin is found in strawberries, peppers and broccoli and potatoes. With the restricted diet detailed above containing only 20% of the recommended Vitamin C levels, poor wound healing and skin condition will be a frequent occurrence. The majority of vitamin D is derived from the sun. However, a small amount of foods do contain the vitamin. Tasked with controlling levels of calcium and phosphate in the body, the vitamin is vital for the health of bones and teeth. A deficiency seen in many ED patients causes osteomalacia – a weakening of the bones. Excellent sources include eggs, oily fish and fortified foods. Vitamin K is an important vitamin within the human body. Tasked with assisting blood clotting, research has also suggested vitamin K is an important building block in the formation of strong bones, an important factor for those with eating disorders. Found in oils and green leafy vegetables, the vitamin is required in small doses of 0.075 mg.
Vitamin E is an antioxidant that helps prevent free radicals from forming during intense exercise, protecting cell membranes and their structures. Vitamin E is often derived from nuts and seeds. Calcium is an important tool in the formation of bones, teeth, blood clotting, transmission of nerve impulses and the metabolism of fat. Sources of the mineral include milk, tofu, cheese and nuts. Only 6.8% of the recommended level of calcium was contained in the daily diet of an ED patient above. This is a dangerously low level that over time would affect the density of bone, quality of hair and teeth as well as the speed and effectiveness of muscular contractions. Iron is an essential mineral that aids the transportation of oxygen around the body. A deficiency of iron, found in meat, dried fruits and green leafy vegetables, will cause anaemia and subsequent lethargy, an important factor in the day to day life of any human being. Low levels of iron in the body severely reduce the body´s oxygen carrying capabilities, reducing the amount of oxygen available to functioning body tissues. Selenium is an antioxidant trace element that plays a huge role in the function of the immune system. Widely available from sources such as fish, meat and eggs it is rare for a deficiency to arise if a varied diet, rich is nutritionally diverse foods in consumed. Zinc has a strong association with immunity, allowing the formation of new cells and enzymes, processing foods and also wound healing. The trace element is found in milk, bread and cereal products. Along with a deficiency of vitamins and minerals, electrolytes, which are vital in many biological processes, decrease in concentration as a result of behavioural traits linked with disordered eating. Reduced sodium concentrations are caused by water loading in order to feel full, excessive sweating, vomiting or bouts of diarrhoea, all types of behaviour associated with ED. Sodium levels vary in food stuffs but good sources are cured meat and salted nuts. Potassium is another electrolyte which is delivered from fruits and vegetables, avocado and fish. A deficiency, referred to as hypokalaemia, arises in those who are malnourished and/or experience frequent vomiting. However, the most common loss of potassium is through purging behaviours linked to Bulimia. Purging also decreases levels of chloride which are replaced by increasing quantities of seaweed, rye and tomatoes in the diet. People who experience eating disorders, particularly Anorexia Nervosa and Bulimia Nervosa often use laxatives in order to accelerate the speed of weight loss. An excess consumption will rapidly reduce levels of bicarbonate in the body, which acts as a buffer against acidity. Vomiting and diarrhoea lead to extreme loses of electrolytes and many associated health problems. A loss of phosphate occurs in this way. An imbalance of electrolytes alters the cardiac rhythm, leading to severe consequences. Further losses occur in smaller concentrations. These include magnesium and additional substances including cholesterol. These are all substances that are required within the body in such small quantities. However, if they are neglected through poor nutrition or related conditions, serious health conditions will occur. Bone growth, infertility and poor cell membrane stability are all consequences of poor micronutrient and electrolyte consumption, solidifying the fact that trace elements play a huge role in overall nutrition. On the whole, eating disorders as a condition must be approached holistically. Their causes and, indeed, treatments encompass all aspects of health, from nutrition to psychology. In this presentation the causes of each disorder have been outlined along with the serious health implications that they cause. Two diets have been analysed, showing the deficiencies in food groups and vitamins that lead to these conditions and, finally, it has been highlighted how and why eating disorders occur within elite sport. We have concluded that the disorders arise due to an abnormal attitude towards food and body image. This attitude leads to altered eating patterns and therefore deficiencies in specific macro nutrients, micro nutrients and trace elements all of which lead to the development of heart defects, infertility and skin problems.